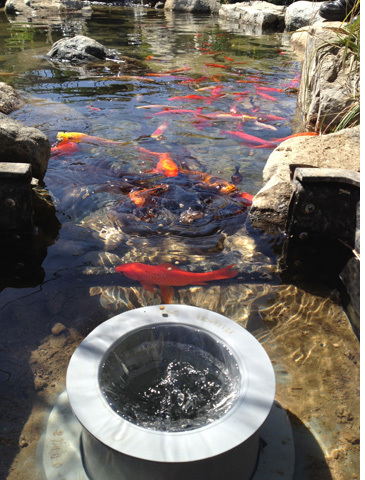 The Helix Pond Skimmer is an excellent choice for all styles of pond construction - Use The Helix for water gardens, koi ponds, lakes and hybrid ponds. The Helix is equipped with Stainless Steel Hardware meaning you'll have no worries about hardware rusting if you need to salt your pond. Whatever style of construction you choose, liner, polyurea or concrete construction, The Helix will exceed your expectations while keeping your fish free from harm. 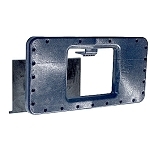 I wanted a heavy duty, super rugged skimmer that's easy to conceal in the landscape! This skimmer needed to be user friendly for submersible and external pump applications while being super efficient at creating surface tension, capable of handling a great deal of leaf debris and most important, fish safe! With the critical needs identified and a quote from Plato, "Necessity, is the Mother of Invention", I set out to accomplish a goal. Let me introduce you to The Helix® Pond Skimmer, the next generation in Pond Skimmers! 35" Tall x 19" Wide x 18" Long - This compact footprint is easy to disguise in the landscape. The Helix can handle a wide range of flow rates from 1500 gph to 8000 gph. With this wide range of flow rates it gives you extreme flexibility in your ponds life support systems and design. Designed for use with submersible or external pump installations, this new pre-filter provides great versatility in pump selection. The Helix is a fish friendly pre-filter designed for optimal surface skimming. The 12" wide mouth of the skimmer opening leading to the area around the circular weir is a "no trap zone" for your pond fish. 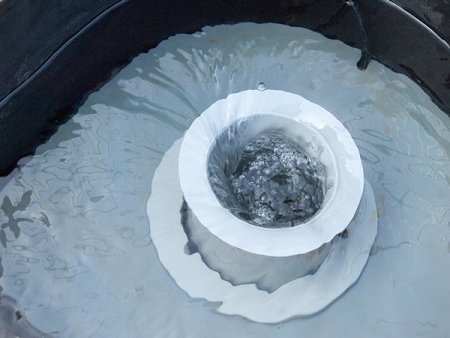 The Helix boasts a 15" circular, self-leveling, floating weir. This compact circular weir competes with the largest skimmers on the market for optimum surface tension. 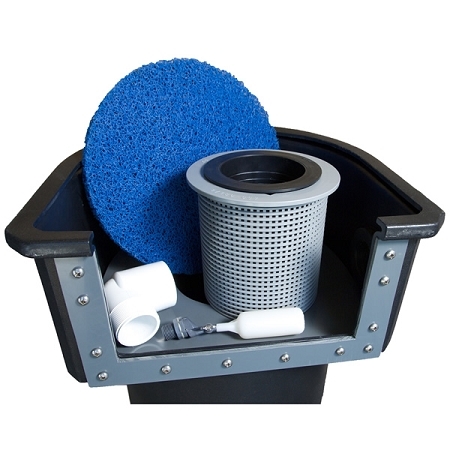 A full 15 inches of surface tension within a specific diameter and an8" round x 8" deep durable Debris Basket give The Helix a vacuum like effect that is capable of capturing a ton of wind blown debris and is super easy to clean. Excellent for all styles of pond construction - Use The Helix for water gardens, koi ponds, lakes and hybrid ponds.The Helix is equipped with Stainless Steel Hardware meaning you'll have no worries about hardware rusting if you need to salt your pond.Whatever style of construction you choose, liner, polyurea or concrete construction, The Helix will exceed your expectations while keeping your fish free from harm. 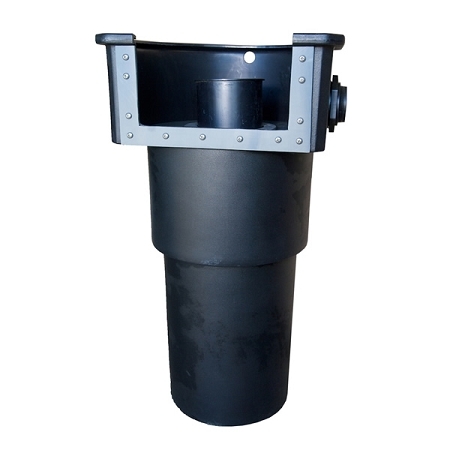 The Helix Pond Skimmer Pre-Filter is manufactured in the USA with a heavy-duty rotational molded HDPE material - This pond skimmer is SUPER RUGGED, overflow compatible with flat spots on the round body for plumbing an efficient overflow up to 2" in diameter and is automatic water fill valve friendly. 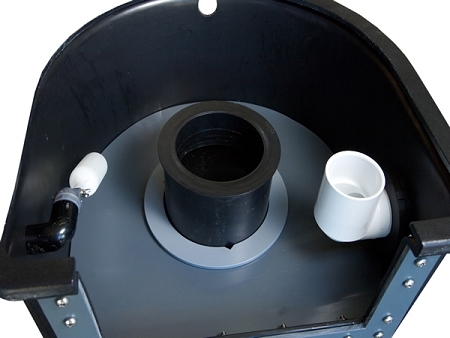 The Helix is roomy enough for the installation of a float valve without your typical issues of malfunction. Easy to install † Easy to maintain † Easy to see why we believe The Helix Pond Skimmer will set a new standard for skimming ponds. 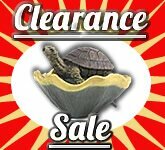 This is what people are saying about our new pond skimmer. 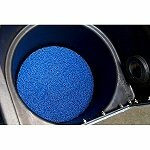 Tip from Graystone Creations: Adding beneficial bacteria to your skimmer weekly is a great way to enhance the biological filtration on your pond. Approximately 7-10 days for shipment.